Calle Johansson has some unfinished business to take care of. Fourteen years after he and the Washington Capitals were swept by the Detroit Red Wings in the Stanley Cup Final, the former defenseman is returning to the franchise he loves in an attempt to help it win the championship that has eluded it since entering the National Hockey League in 1974. "I don't have a Cup," said Johansson, who was named an assistant coach for the Capitals on Wednesday. "People ask players and they ask coaches, 'What's the biggest thing you can win? Is it the Olympics or is it the Stanley Cup?' I know that they are pretty politically correct when they say, 'Well, it's both pretty big.' To me, to win the Stanley Cup with players or coaches that you side with every day for nine months or 10 months, that is the absolute ultimate goal and the biggest thing you can do. For me, that's really unfinished business. "The team in Washington is a great hockey team and has great potential. To me, it was just a perfect situation." Johansson, 45, holds the record for the most games played as a Capital, appearing in 983 from 1989-2003. Johansson holds franchise records for points (474) and assists (361) by a defenseman and ranks third in goals (113). Along with new coach Adam Oates, Johansson joins associate goaltending coach Olie Kolzig as members of the Washington squad that played in the 1998 Stanley Cup Final. Johansson helped the Capitals reach the playoffs in 11 of his 15 seasons and holds franchise playoff records for games played (95) and points (54) by a defenseman. Oates -- who replaced Dale Hunter on June 26 -- reached out to Johansson shortly after getting the job to gauge the latter's interest in joining the coaching staff. Although he's spent close to a decade in his native Sweden, the opportunity to return to Washington and work with a former teammate and close friend was too good to pass up. "I've always admired Oatsy for his smartness and intelligence," Johansson said. "If you look at the teams he has been an assistant coach, he made those players better that he worked with. I only see an upside with Oatsy as a head coach. After talking to him and meeting up with him last week and a few weeks back, the energy and the willingness to do something good and how positive he is, it's just great to see. He's like a kid in a candy store with this job now. He loves to do this." "To me, to win the Stanley Cup with players or coaches that you side with every day for nine months or 10 months, that is the absolute ultimate goal and the biggest thing you can do. For me, that's really unfinished business." Johansson played in 1,109 NHL games, collecting 535 points (119 goals, 416 assists) and 519 penalty minutes. He originally was selected by the Buffalo Sabres in the first round (No. 14) of the 1985 NHL Draft and was traded to Washington on March 7, 1989. 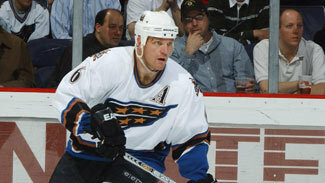 He worked briefly as a scout for the Capitals before coming out of retirement to play for the Toronto Maple Leafs at the end of the 2003-04 season. Johansson represented Sweden at numerous international tournaments, including the 1983 and 1984 (gold medal) European Junior Championships, the 1986 and 1987 (bronze medal) World Junior Championships, the 1991 Canada Cup, the 1991 (gold medal) and 1992 (gold medal) World Championships, the 1996 World Cup of Hockey and the 1998 Winter Olympics. Following his playing career, Johansson became a color commentator and provided analysis for Swedish television for both the Swedish Elite League (SEL) and the NHL. He was an assistant coach for Frolunda of the SEL during the 2006-07 season before returning to broadcasting. Now he's back in the city where he spent the best years of his playing career, ready and willing to help the Caps win a championship. "I'd been asked through the years in Sweden if I ever wanted to coach again, and I said, 'Yes, I do want to when the situation is right,'" Johansson said. "When there is people around me that I really like and trust and know and think hockey the way I do … and then, Adam called me and asked me a few weeks back. It just felt right. I've always loved the Washington Capitals. "I've always wanted to come back in some form. I'm just really grateful and lucky to be there again."